There are many arguments about how public charging stations affect the adoption of electric vehicles in North America. Some say people charge at home most of the time so it doesn’t matter; others say people need to know they can charge outside the home to avoid range anxiety and get more use out of their cars. These scenarios are not hypothetical. The above can be done in 2016 with a) a Tesla Model S and a Supercharger, b) a Nissan Leaf at the main Santa Monica parking garage and c) any Tesla using a fast-charging station on the Northeast corridor. In fact, there have been major increases in the number of Level 2 charging and DC fast charging stations over the past year alone. Here is the state of electric vehicle charging in 2016 as told in maps (from our friends over at ChargeHub). Looking at the map of Level 2 charging ports at the end of 2015, we can see significant infrastructure in place, with the highest concentration of plugs in California and the North Atlantic region stretching from Maryland to lower New England. Chicago, Detroit, Montreal, South Florida and the largest Pacific Northwest cities also feature plenty of options for EV drivers in need of a charge. According to ChargeHub, there were 27,950 plugs available at the close of 2015. Just nine months later (September 2016), the number had jumped to 33,688 plugs – a difference of over 20%. You can see the dots connecting along the Northeast Corridor where I-95 connects the cities of Boston, New York, Philadelphia, and Washington, D.C. Other changes are subtler, but the numbers show the U.S. gained over 5,000 Level 2 charging ports to hit 30,416 plugs by August 30. Canada gained over 500 plugs over the same nine-month span to hit 3,272. Growth was also close to 20% with Quebec showing improvements year-over-year. Electric car drivers on the hunt for DC fast chargers (also referred to as Level 3 chargers) have much fewer options. 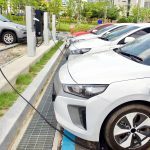 Of course, this is to be expected given the purchase and installation costs for a system that can power an automobile to 80% charge in as little as 30 minutes. At the close of 2015, there were 2,805 DC fast charging plugs in North America, with the lion’s share (2,650) located in the U.S.
Nine months later, drivers could find 4,269 fast charging points in the same stretch of the Western Hemisphere, which represented a 33% increase in just nine months. This expansion of the network was the same on both sides of the border between Canada and the U.S.
Again, the Washington, D.C.-Baltimore area has the most visible growth when looking at the maps, while the Los Angeles area’s concentration of fast chargers became even more pronounced over that time period. 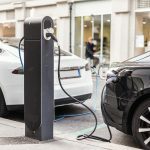 The recent completion of the Express Charging Corridors — a joint effort by ChargePoint, BMW, and Volkswagen – was the most notable upgrade along the East and West Coasts. Clearly, the plan is to eliminate the need for EV drivers to get a rental car when traveling between cities. Trips between Boston and New York (215 miles), New York and Philadelphia (96 miles) or Philadelphia and D.C. (138 miles) should not be intimidating to EV drivers now. When the Chevy Bolt EV and Tesla Model 3 join the club with 238 miles and at least 215 miles, respectively, you will see EVs state their case even more clearly. Of the 39,000+ charging ports now available in North America, over 7,000 came online between August 2015 and August 2016. The heat map above shows the biggest gains coming in California, where residents have registered about half the electric vehicles on the road in the U.S.
As the country’s biggest auto market with a rapidly expanding population, California has an obvious need to reduce emissions. The lack of public transportation infrastructure in places like Los Angeles plays an important part in this issue. In most cases, L.A. residents need a car to get around the city, even if it means braving traffic. In the Northeast U.S., city commuting is largely possible on public transport. With the public charging map looking more and more complete in areas of high EV adoption, automakers like Tesla, BMW, and Volkswagen deserve credit for their efforts along with charging station providers. ChargePoint, North America’s largest provider of plugs, points out that drivers can charge for free at over half of its stations. (Parking fees apply at many free stations.) Changing habits is another part of the equation. “It’s important to remember that EVs change the way people refuel, shifting from a fill-up model to a ‘top-off’ model where drivers continually sip electricity at the places they spend time throughout the day,” a ChargePoint spokesperson said. 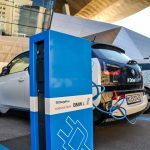 “That means that charging needs to be everywhere that EV drivers go.” As a result, the company aims to offer solutions for everywhere a driver might be in the course of a day in town or weekend out of town. If this trend continues, the angst about driving an electric car without a place to charge – known to many as range anxiety – should die a peaceful death in North America. Note: want to embed these maps on your site? Shoot us an email :) sunny@fleetcarma.com.